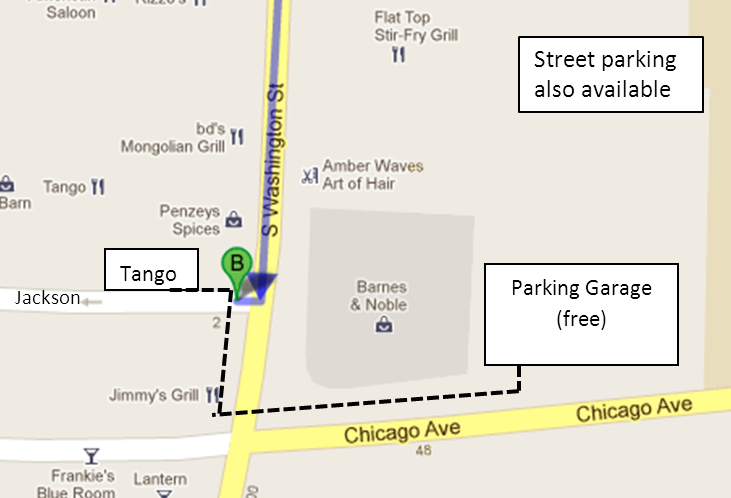 By popular demand, the collaboration meeting will return to the Tango Grill, in Naperville. $45/person will include unlimited tapas buffet, non-alcoholic drings, and ~1 bottle of wine or pitcher sangria for every three people. Additional alcoholic drinks may be purchased from the server. Click here for menu. Dinner will be Tuesday, May 8, at 7PM. Click here for directions. Parking is available on the street or in a nearby free garage (see detail). We will need a final head count by lunchtime on Monday, so please modify your registration accordingly! Make payment by cash or check (to Eric Prebys) by lunchtime on Tuesday. Receipts will be provided.